Jennifer received her Bachelor of Arts from the State University of New York at New Paltz in French, Anthropology, and Communication Media Production with a Theatre Arts minor in 2012. After losing sixty pounds working with a dietitian, she realized that her true career path involved fitness and nutrition. She became licensed to teach Zumba and obtained her group exercise certifications from the Aerobics and Fitness Association of America as well as the Aquatic Exercise Association. She also holds the title of Certified Personal Trainer from the American College of Sports Medicine. She went back to school and obtained her Bachelor of Science from the Rochester Institute of Technology in Nutrition Management in 2016. 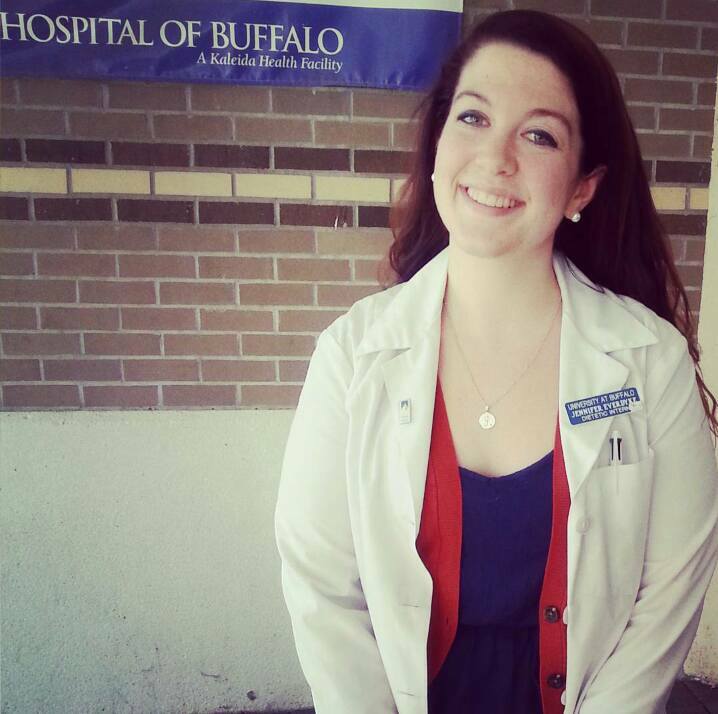 She currently is completing her Dietetic Internship and Masters of Science in Exercise Science at the University at Buffalo. Outside of school she teaches fitness classes at the YMCA and works at a long term care facility in Rochester, NY. They say that right before you die your life flashes before your eyes and you see all of your most important life memories. IF that’s true then my entire life looks like the light grey interior ceiling of a Honda Civic. I am pretty sure I say “WTF! ?” angrily to myself a minimum of five times each day. As I am a dietitian, obviously that means “what the food!? !” my expletive of choice. Or not. You decide. Last weekend I ran my third half marathon. Very slowly. In the pouring rain. When you’re pushing yourself to finish 13.1 miles in the midst of torrential downpours, you have a lot of time to think. I invite you into the recreation of what went through my mind over the course of the Rochester Flower City Half Marathon. In my time as a dietetic intern at one of the local hospitals I had the opportunity to meet a woman with a Body Mass Index (BMI) of 95. Now, BMI isn’t my favorite way of measuring health status, but a BMI of 95 put this individual five categories above “morbidly obese.” The Center for Disease Control doesn’t even have a named classification for a BMI that high. For those of you who aren’t as familiar with BMI as I am, that means that this individual was 5’4” and approximately 500lbs. Have you had your mid-mid-life crisis yet? You know the one I’m talking about, where you think about the fact that you’re no longer in your early twenties, but your mid-twenties. Or, maybe you’re like me and are closer to your late twenties and that terrifying tyrant THIRTY is peaking around the corner. I chose to go back to school as an adult to follow my passion. It’s been great and I’m close to fiiiiiiiiiiiiiiiiiiiiiiiiiiinally being a Registered Dietitian, but sometimes it makes me sad. Did you know that your digestive system has bidirectional communication pathways that connect to both sympathetic and parasympathetic nervous systems and that signals received in the digestive system can have an effect on reducing stress-induced corticosterone, anxiety, and even depression like symptoms? The digestive tract or “gut” is pretty integral to our well-being. When there is injury to the upper digestive system (mouth, esophagus) a tube is placed to direct nutrients into the stomach, or even the small intestine, in order to keep the remainder of the gut functional and prevent necrosis. This functionality allows for many wonderful things in your body to continue, such as the prevention of those depression like symptoms I mentioned above. WHAT! Isn’t that CRAZY? !